Dealing with conflict is a necessary part of leadership. 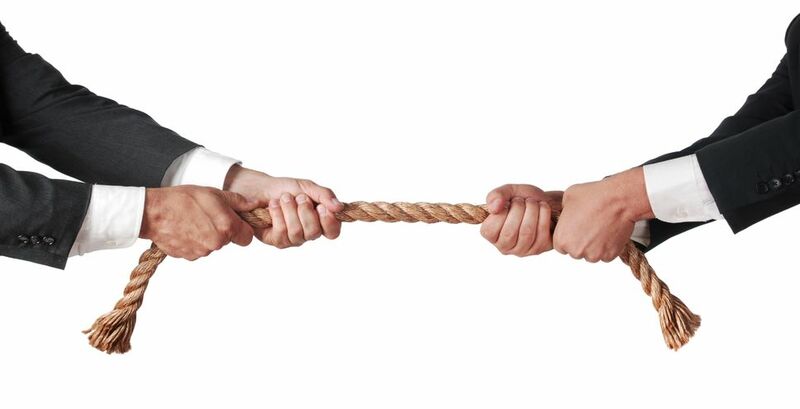 In fact, conflict in the workplace is not only unavoidable, it’s healthy. Differing opinions and divergent thinking is a GOOD thing. Without conflict, you have groupthink, you repress innovation, and you discourage learning, none of which are ideal for a productive work environment. Effective leaders know how to deal with conflicting interests in a healthy and productive fashion. Developing conflict resolution skills is essential in leadership. But what happens when conflict between two individual team members or departments is ongoing and a stalemate has occured? When people have become so entrenched in defending their turf, they have become positional? When the relationship has broken down to the extent it’s interfering with effectiveness? How do we loosen the rope and encourage positive forward movement? The Fifty One Percent Rule is a useful tool I have successfully used in my coaching practice, when my clients are dealing with ongoing conflict. Developed by international coach/author, Prof. Angus McLeod, it essentially means we assume 51% responsibility for any given interaction with another person. If I were less than 50% responsible then I may well decide to do nothing. Conversely, if I were 100% responsible, I could exhibit neurotic behaviours and interfere in matters which don’t concern me. But, by establishing my responsibility at 51%, I put the onus on myself to act and not let the issue stew. This rule is simply a tool which encourages a new perception to the situation. There are those of us who take on too much responsibility. And there are those of us who tend to wait for the other person to make the first move. This approach helps both parties find a more healthy way forward. If you’re 51% responsible for any given interaction, you can’t be locked in stalemate. Have you applied the Fifty One Percent Rule before? If so, what results have you experienced? What tools do you find effective when dealing with conflict situations?